What do you do when you’re a woman running for congress on a pretty small budget? Go online of course! This week’s Power of Storytelling will make you cheer. You’ve got a mission statement, but do you have a values statement? Another great read from Mary Cahalane. Richard Turner is one fundraiser I’m proud to know who always makes me think. Why the fundraising model is broken (and why this couldn’t be a better time to fundraise). What you need to know about generational giving. “Baby Boomers are not even close to relinquishing their position as the top donors. They continue to represent the greatest portion of total giving.” From Pareto Fundraising. Right now, vigorous, informed –and persistent–dissent is more important than ever. Particularly for those who believe that democracy is the most acceptable form of government. Roger Craver with Celebrating Dissent. There’s something wrong with fundraising. And I say this because, despite the wealth of great information available, there remains a shockingly high percentage of fundraisers who know next to nothing about the basics of fundraising. 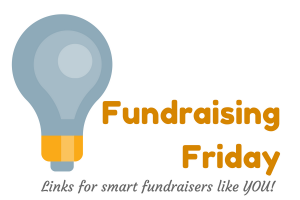 When it comes to your fundraising, are you crowdsourcing ignorance? Ask for money, get advice. Ask for advice, get money twice. Wise words from Pitbull. Announcing Raise More Money With Donor Surveys, our newest Basics & More™ class. In this four-week course, you’ll learn how to develop a survey to uncover potential major gifts, planned gifts, and legacy gifts, the biggest mistake you’re probably making in your survey, and how to incorporate surveying and donor feedback in your communications throughout the year, and so much more! This class will revolutionize your fundraising. “It’s the best antidote I’ve read on taking the fear out of asking. It will make you successful. If you already are, it will make you more so.” So says Jerold Panas about Brian Saber’s new book, Asking Styles: Revolutionize Your Fundraising. Join us for our next Motivate Monday when Brian joins us to share tips from this month’s book drawing book! Save your seat here. Motivate Monday, sponsored by Bloomerang. Previous post: Power of Storytelling | MJ Hegar is a door-busting, wall-breaking warrior…on a budget!